the Solomon Firm is dedicated to getting our clients the positive results they deserve. Whether in the courtroom litigating or finding innovative out-of-court solutions to our clients’ legal problems, The Solomon Firm is dedicated to getting our clients the positive results they deserve. Our goal is to protect, encourage, and empower our clients through challenging times, such as divorce, recovering from a serious injury, or facing criminal charges. There is no reason to settle—legally or in life—if a better outcome is possible. We will fight the good fight with you every step of the way, with tenacity and integrity, so you can know, that when pushed to the limits, you gave your all. Family law encompasses all the legal issues affecting family relationships, including divorce, annulment, child custody, child support, alimony, property division, legitimation, paternity, prenuptial agreements, and grandparents’ rights. While these matters are all highly personal and may involve issues that you don’t want to discuss with anyone—relative, friend, or attorney—Georgia courts have the ultimate say on how conflicts involving divorce, child custody, child support, paternity, etc. are resolved. For this reason, it is imperative to discuss your situation with an experienced Atlanta family attorney before filing any papers or accepting any agreement, no matter how difficult it is to face the circumstances at hand. Decisions regarding family law matters can affect you and your loved ones for years, if not a lifetime. The Solomon Firm won’t force you into a settlement when you should litigate to assert your legal rights and interests. We are ready to go to court for you! Many law firms handling family law matters and other civil law issues encourage settlement too quickly and too frequently. At The Solomon Firm, we believe some things—like your relationship with your child or your hard-earned business assets—are worth fighting for. We evaluate on a case-by-case basis to determine the best course of action to achieve each client’s unique goals. If a no-fuss settlement is the best course of action, we’ll go that route, but if a better outcome is possible through litigation, that’s what we do. Many days we spend all day in the courtroom fighting for our clients’ rights. Our civil litigation practice covers all the legal issues affecting your day-to-day activities, both business and personal. The Solomon Firm’s willingness and ability to handle all these issues is why we’re The Only Lawyer You Need. Civil litigation deals with legal disputes between two or more parties with the goal of obtaining monetary damages or specific performance rather than taking criminal action for legal wrongs. The Solomon Firm has successfully litigated civil matters pertaining to environmental law, landlord-tenant disputes, product liability, intellectual property, construction law, medical malpractice, employment and labor law, and more. With experience representing clients in trials, hearings, arbitrations, and mediations before administrative agencies, foreign tribunals, and federal, state, and local court, attorney Tricia Solomon has the knowledge and resources required to lead you through this wide-ranging area of law with high-impact results. We offer aggressive representation in personal injury cases, working to obtain maximum compensation that covers the full cost of injuries and damages. Car accidents, truck accidents, slips and falls—these types of accidents happen all the time, and occur in a matter of seconds, but the injuries that result can last months, years, and even a lifetime. When you are hurt due to the negligence, recklessness, or wrongful act of another, you, as the victim, shouldn’t have to suffer any further. As your personal injury attorney, our goal is to obtain maximum compensation for your time off work, medical expenses, and pain and suffering, along with ensuring you receive appropriate treatment for your injuries. If you or a loved one has been charged with a crime in Atlanta, The Solomon Firm provides strong criminal defense representation and guidance through the Georgia criminal justice system. Being charged with a crime is scary, intimidating, and confusing. For example, you have likely heard a range of advice—perhaps conflicting—on what to do if you’re pulled over for suspicion of DUI and charged with driving under the influence. Should you fight the charges or plead no contest in hopes of putting the matter behind you? The Solomon Firm has clear answers to your questions, as well as the strong criminal defense representation you need to go beyond simply putting the matter behind you, but also to ensure that criminal charges have as little effect on your life as possible. Contact The Solomon Firm today! For more information about The Solomon Firm and the legal representation we provide, please contact our Atlanta offices and schedule a free initial consultation. We are conveniently located in the Buckhead area and serve clients throughout metro Atlanta. As our client, you can expect bold and effective solutions to your most pressing legal concerns. Attorney Tricia Solomon graduated from The George Washington University in 1997 with a degree in Journalism. After college, Ms. Solomon accepted a position as a sports production assistant at CNN Sports Illustrated, which brought her to Atlanta, Georgia. Ms. Solomon would spend four years at CNNSI before leaving to pursue her true passion of becoming an attorney. 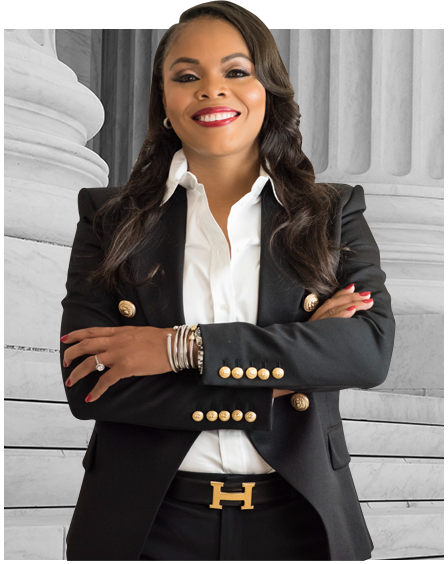 To achieve her goal, Ms. Solomon relocated to Athens, Georgia to attend The University of Georgia School of Law, and graduated in 2006. © 2019 The Solomon Firm LLC. All rights reserved.